This ley runs SSW-NNE for just over two miles from Friston Forest, over Windover Hill and the Long Man, to the village of Wilmington. It seems as if other leys may pass through and near the Long Man, and we in no way claim this to be the best. Friston Forest, at the S end of the ley, contains the first ley point: a tumulus at 5380015. The forest is a beautiful place for walking in, but an extremely difficult one for locating tumuli! There is now one more path near the tumulus that is marked on the maps, and it is virtually impossible to take meaningful compass bearings in the forest environment. Although the densely overgrown area containing the tumulus was determined during our fieldwork. We were unable to actually sight the feature. The tumulus is a bowl barrow according to O.S. references. In 1976 a UFO was sighted over the Friston Forest area. The second point is not only less disappointing, it is extremely impressive: the round barrow atop Windover Hill at 54200325. It is 135 feet in diameter and apparently contained a cremation in an urn, placed in a pit under a pile of flints. The bearing goes cleanly through the mound, fractionally to the W of the very top, from where Wilmington Priory and Church can just be glimpsed down beyond the N edge of the hill . This hilltop is a wild, elemental place, a fit setting for the various giant legends associated with it. Flint pits on the hill are said to be craters formed by missiles hurled by the giant on Firle Beacon (where a UFO has been sighted) at the giant of Windover Hill. This could be a sighting legend. Another version says that the giant fell over the steep N edge of the hill and broke his neck - the Long Man on the N slopes if the outline drawn round the giant's dead body. Beneath the outline a Roman is supposed to be interred in a golden coffin. A third version of the legend hints a memory of the ley being described here: it says that the giant was killed by pilgrims on their way to Wilmington Priory - our fourth ley point. Before reaching the priory, the third ley marker, the Long Man himself, is encountered (54250345). The figure, about 237 feet in length, is featureless, and holds staves in both hands. He was overgrown and known as the Green Man until the 19th century when he was recut and the outline filled with bricks by a local antiquarian of somewhat puritanical taste. It is thought by some that the figure may have been emasculated during its renovation. The origins of the figure are unknown. Current opinion is that he may date from Saxon times because of the discovery of a similar figure on a Sutton Hoo helmet. This could simply mean that the Long Man was taken as a symbol by these people; but popular opinion has traditionally assumed that the figure comes down from the Bronze Age. 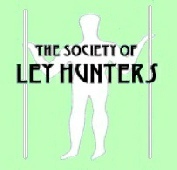 He has been thought to represent many characters, Beowulf, Woden, Thor, Apollo, Mercury among them, but to ley hunters he is what Alfred Watkins claimed him to be - the prehistoric surveyor, the Dodman with his sighting staves. As if to emphasize his geomantic connections, a line drawn between the nearby churches of Selmeston and Jevington crosses a line drawn between the churches of Alfriston and Folkington exactly at the site of the Long Man. The late T.C. Lethbridge recalled being told by a shepherd that the Long Man once had a companion, and that the two figures were known as Adam and Eve. J.P. Emslie heard of a folk memory in 1905 relating to a figure on a hill above Alfriston, not far from the Long Man, showing a man being thrown from a horse. As this image occurs in the Glastonbury Zodiac (see page 122) it is difficult not to speculate that the Long Man could be the last visible remnant of a mall terrestrial zodiac depicted in chalk hill figures on the South Downs. The fourth ley point is the Benedictine priory at Wilmington (54380424). The site was occupied soon after the Norman Conquest and the priory was built early in the 12th century. Beneath the priory is a crypt, exactly on (or under) the ley, the purpose of which is 'uncertain' according to the plaque on the crypt wall. The original access is now lost, the present entrance being Tudor, in 1413, after the Anglo-French wars, the priory ceased to be a religious community and became a farmhouse. It is open to the public. The fifth and final ley point is the church of St. Mary and St. Peter, very close to the priory but in line with it and the other features on the ley, at 54410428. There is a rumour that there was a church on the site in Saxon times, but the present one was founded in the 12th century. Another tradition recalls that the church was linked to the priory crypt by a short tunnel. If so, it would have had to run precisely along the course of the ley. By the N side of the church is an immense yew, 23 feet about the trunk, probably a thousand years old. Yews are associated with many traditions, particularly those to do with witchcraft, and the dowser Guy Underwood studied them from the point of view of geodetic phenomena. He found that they always marked a blind spring. As both yews and blind springs are so often associated with ancient Christian and prehistoric sites, Underwood concluded that the tree was planted at such places to denote a sacred spot. The location of Friston Forest round barrow was found, in the Megalithic Portal, to be TQ53760107. The Priory is more accurately located at TQ54400425, and the Yew is in line at TQ54420430.